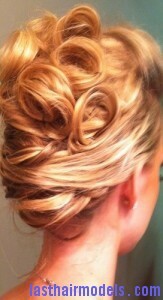 The French twist updo is a very beautiful hairstyle that is a perfect choice for a formal or casual event. Most of the women like to wear this style for everyday as it helps to keep the hair out of their way. It is a perfect hairstyle for people with medium to long hair to make it look unique. Before starting the styling process, first create a French twist a day after washing your hair to keep the natural oil that can help the hair stay in place. Then comb the hair to create a loose ponytail at the lower back of the head and in case there are any stray strands, try to use a hair gel to keep it in place, or secure it later. Next use a leave-in conditioner all over the hair to keep the flyaways in place. 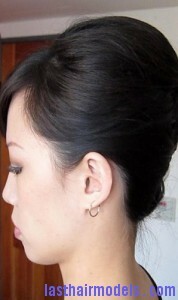 Lift your ponytail up against the back of your head and twist your hair to create a roll. Tuck the ends under to bend the roll on top of the finished twist. Tuck the roll inside and under itself until the outer edges of the roll disappear or leave the ends free to get a casual look. Use a damp fine-toothed comb to smooth the hair out and secure it with hair pins. 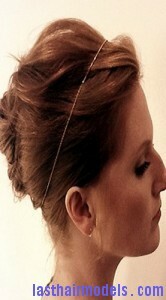 Style the hair with additional accessories like flowers, shaped combs or decorative pins. At last mist the hair with a little amount of hairspray to keep the hairstyle smooth and elegant.